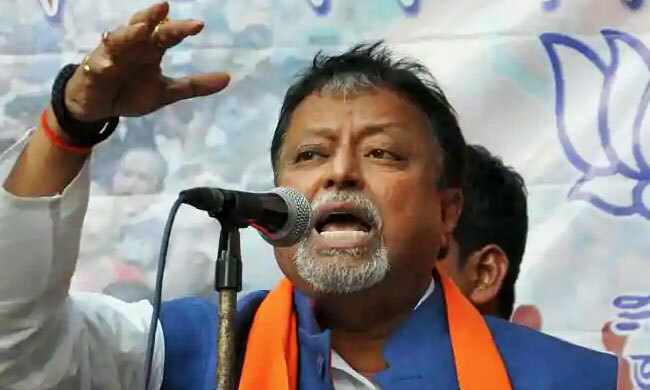 The Calcutta High Court, on Wednesday, granted interim protection to BJP leader Mukul Roy, who is accused in named in an FIR in the killing of a Trinamool Congress MLA in Nadia district. Roy had filed anticipatory bail plea contending that he was booked out of "political vendetta" and was in no way linked to the murder of Krishnaganj MLA Satyajit Biswas on Saturday. While granting the relief, the division bench comprising Justice Joymalya Bagchi and Justice Manojit Mandal observed that vague and/or nebulous suspicion arising from statements of political opponents ought not to jeopardize the fundamental right of liberty of a citizen. "While mere suspicion may justify registration of FIR, arrest of an individual must be founded on reasonable suspicion arising from credible and reliable materials and not vague surmises and speculations." the court added. "No doubt, the offence is a grave one. A member of the West Bengal Legislative Assembly was gunned down while attending a Puja celebration. First Information Report alleges that Sujit Mondal, Kartick Mondal and Kalidas Mondal held the victim and one Abhijit Pundari fired at him. Although the petitioner is named in the First Information Report as a conspirator, no overt act is attributed to him in the murder of the victim. It is alleged that the petitioner had inimical relationship with the victim who was an elected representative from the ruling political party in the State and had considerable influence in the community wherein the petitioner and his political party were seeking to make inroads and gain political support. Statements of the co-accused in custody make reference to the inimical role between the petitioner and the victim. Similar statements have also been made by some witnesses. However, investigation till date has not revealed any contemporaneous complaint to police or other authorities at the behest of the victim or his family members with regard to the alleged hostile attitude of the petitioner against the victim." The bench, taking note of the political clout of the BJP leader directed: "We direct in the event the petitioner cooperates with investigation and renders himself available for interrogation by the investigating agency at any appropriate place so specified by the investigating agency upon a day's notice to him at the address stated in the petition and/or to his advocate on record, the petitioner shall not be arrested in the present case till 7.3.2019 or until further orders. The petitioner shall not enter the district of Nadia until further orders except for the purposes of investigation and/or attending court proceedings and shall not intimidate witnesses nor tamper with evidence in any manner whatsoever." The bench has posted the case for further hearing on 5th March 2019.